I work in central London and as much as I love it, the commute and pollution definitely takes its toll on my skin, making it look and feel dull. This brings me to facial oils, which are known to help revitalise your skin, they dissolve impurities in the skin far better than water based products. At first I struggled with the idea of facial oils, I have combination skin so the thought of smothering my face in oil was not something I jumped at. However, I have now embraced these and am a bit of a fan. 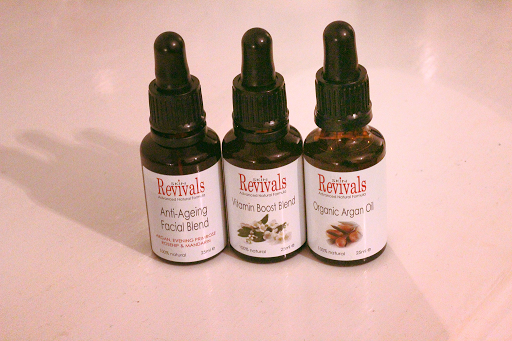 The new Skin Revivals Facial Oils are 100% natural, the products that caught my eye were the Vitamin Boost, Anti-Ageing Facial Blend and of course Organic Argan Oil. Just a couple of drops applied daily and you already feel the difference, my skin feels more hydrated and brighter. Any product with the word ‘vitamin’ in the title and I’m sold. I use this in the morning after cleansing my face, for maximum effects the tip is to apply this when your skin is still moist to help lock in the moisture. My skin does feel greasy at first, so I try to apply it early enough for it to sink in before applying my make up. I have been applying this before bed, again after cleansing my face. I feel as though it is getting to work as I sleep which is great. I love the smell, it is a really refreshing citrus scent. This contains Evening Primrose, Argan Oil, Rosehip Oil, Sea buckthorn Oil (which consists of vitamins A and E) and Mandarin Oil. Argan Oil is the magic ingredient, claimed to nourish and protect skin, hair and nails. It contains vitamin E, essential fatty acids and antioxidants as well as being renowned for its anti-ageing properties. As I have been using the other two products for my skin, I have used this on my hair and nails, it has been brilliant at helping to keep my nails strong as the weather has turned cold.